China Machinery Engineering Suzhou Co., Ltd.
Fast Delivery: 7 days after firm order for most item. 2.We have been established business relationships in more than 70 countries in the world. 3.We have a factory manufacturing professional kitchen equipment. 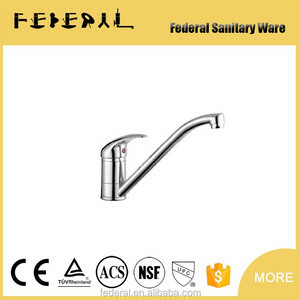 Yuhuan Federal Sanitary Ware Manufacture Co., Ltd. 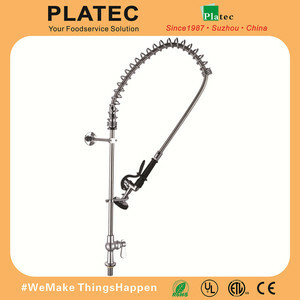 Features: 1: Pre-rinse faucet 2: Deck mounted type 3: 31-7/8"(962)high 4: With swivle arm support heavy duty,mounts to riser pipe and swivle arm 5: Swivle arm mated to spra valve 6: The spray valve conforms to ANSI/ASTM F2324-03 7: Available with 12"(305mm) swing arm offering a full 360&ordm; rotation. 8: 6"(152mm) wall basket included 9: The product includes check valve to prevent cross-flow 10:Ideal for food service,commercial kitchens,restaurant and hotel applications. Jiangmen Eloira Sanitary Ware Co., Ltd.
Unifit Industrial Supply Co., Ltd.
For OEM, your brand logo can be lasered onto the product once receipt of your letter of authorization. Q8: How's lead time and cost of developing new prototype9 Different design, different leadtime and cost. The prototype cost can be refund once total order quantity reach a certain amount. 3.10 years export experience,45% goods export to Germany market, Strict perfect quality control system. 6.We have a professional r&d team,5 person, can do ODM service, each year design new item 5 sense. 7.5 years guarantee, we take responsibility for any claim goods. 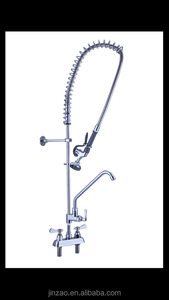 Pre-rinse faucet 1)Deck-mounted type 2)20"(510mm)riser brass pipe 3)6"(152mm) wall bracket included 4)44"(1118mm)flexible stainless steel hose 5)The product includes check valve to prevent cross-flow 6)Ideal for food service,commercial kitchens,restaurants and hotel applications. 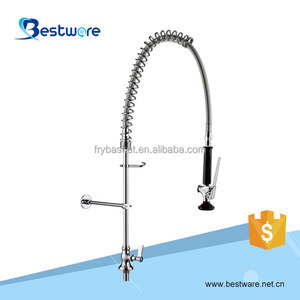 Alibaba.com offers 325 pre rinse unit faucet products. About 55% of these are kitchen faucets, 2% are basin faucets, and 1% are bath & shower faucets. A wide variety of pre rinse unit faucet options are available to you, such as polished, brushed, and oil rubbed. You can also choose from contemporary, classic, and traditional. As well as from single handle, dual handle. 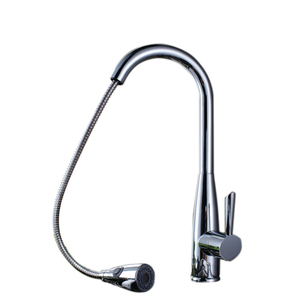 And whether pre rinse unit faucet is ceramic, brass, or stainless steel. 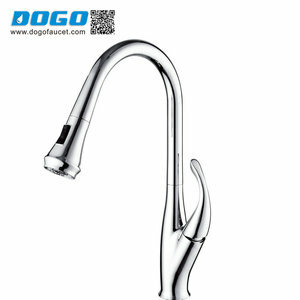 There are 231 pre rinse unit faucet suppliers, mainly located in Asia. 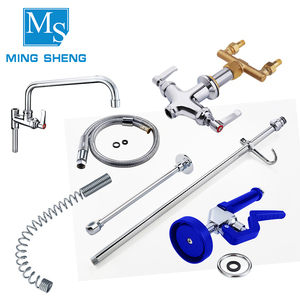 The top supplying countries are China (Mainland), United States, and India, which supply 95%, 2%, and 1% of pre rinse unit faucet respectively. 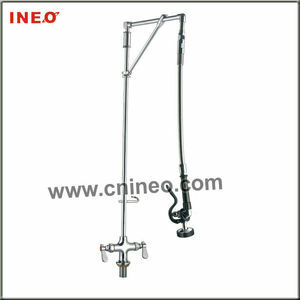 Pre rinse unit faucet products are most popular in North America, Western Europe, and Domestic Market. You can ensure product safety by selecting from certified suppliers, including 5 with ISO9001, 4 with Other, and 1 with OHSAS18001 certification.